Am i just being neurotic or is anyone else unnerved by all the intense backlash this is getting? Like Beauty and the Beast or Maleficent never received so much vitriol. I wonder if that is because people are really tired from all the remakes. Maleficent was really early and it is a reimagining more than it is a remake. It might be that or people simply don't like what they have seen so far. This looks like it has low production values, like it's made for TV. Disney still thinks Shrek's opinion of their movies is relevant. I kind of blame Shrek for the way major animated films are made as well as how Disney is marketing their films. There used to be a little more variety in tones like going from serious films to comedic and now it's all comedic with pop-culture humor and nearly every single character speaking in a sarcastic or high on caffeine sort of voice. Not only that, but it has to be spelled out that certain characters are not like there predecessors so that the audience will not be offended for no reason at all. Elsa may have been the one to say: "You can't marry a man you just met." But I think by that point, Disney had already established that they were capable of presenting growing relationships that didn't happen overnight. I keep thinking about Belle how she flat out rejected Gaston because she knew what a jerk he was and wasn't initially interested in the Beast until he started to treat her with respect. But I guess she didn't explicitly state that too clearly out loud to the audience, than that makes her a bad character. And I just want to be clear. If people have don't like the early films, that's totally fine. But it would be a little nice to hear more valid reasons than just somebody either parroting or basing their opinions on foggy memory. Last edited by Tristy on Tue Feb 12, 2019 10:47 am, edited 1 time in total. Robbin williams was irreplaceable. No one can even name any of the voice actors in beauty and the beast and whatnot. Not outside the fandom. People have also started to turn on Will Smith thanks to his youtube presence. On top of that, the CG makes no attempt to create a genie of its own, just uses will's image. Then you have the smaller things like the way they didn't really attempt to cast middle eastern people. There's almost nothing good going for this movie. Except for maybe the instrumentals. We haven't even heard Aladdin speak, our main character. I agree with this, especially about Beauty and the Beast. It is such a nuanced film that most casual Disney watchers miss the point of the film nowadays. I also liked how in the 90's films they made characters with actual flaws and moral ambiguity, thus their devolpment is more meaningful. Today it seems like they are afraid to make the characters "problematic". No one takes risks anymore. Despite all the mixed to bad reception the movie is getting and having been burned by Maleficent, AiW and BatB, I'm actually rather interested in how this one will turn out. Mainly because they seem to be doing their own thing, with a different kind of energy, and not making a carbon copy of the original. Even the cast they assembled seem to be there because of their talent and not their popularity (minus Will Smith, though I would argue he's not as popular as he was 10 years ago). I would have preferred if it wasn't a musical, but hey, what can you do. Even the Genie's look is not bothering me nor do I find him creepy. I fully agree with Tristy and farerb. Creating strong female characters nowadays no longer means making an authentic and believable character with flaws and complexity but a perfect and polished role model who explicitly and heavy-handedly personifies female empowerment. Comparison between the animated and live-action footage released so far. I agree, Kyle, about some of the hate being directed at what people see as Robin Williams' role being re-made with a new actor. I would have preferred if it wasn't a musical, but hey, what can you do. Getting another version of the soundtrack is the main thing/one of the only things I look forward to with the remakes, really. True, most of the songs never match the original, but the score gets an upgrade, you get new songs to sing along to ("Aria," "Days in the Sun," "Evermore," Celine's "How Does a Moment Last Forever") and occasionally you get different takes of songs/characters that's worth seeing at least once. *shrug* Usually the re-makes give me an excuse to think about / re-examine the original film more than anything else. IMO, this is a lie. I don't see characters like Tiana, Elsa, Anna, Judy, or Moana as "perfect" by any means, but they are active, powerful characters who drive their own stories--they're also all by far better characters than Jasmine, imo. An empowered character isn't the same as a flawless character. I'd take any of them any day over this creepy glorification of a regressive past. I also see that those characters are imperfect. But my point is more about how everything has to be spoonfed to us so that we don't jump to the wrong conclusions. And it doesn't just apply to the princess movies or just Disney films in general. Disney made good characters in recent films, they are just not as "grey" as the ones in the 90's. Their biggest flaws are clumsiness and insecurities. Clumsiness/awkwardness especially has gotten really stale. In the 90s, we only had to deal with Hercules having that, but it seems like every other Revival character has this to an extent. I agree that characters aren't as gray anymore. I don't believe a character like the Beast would be created in this day and age. And certainly not Meg, a heroine working for the villain and trying to actively seduce the hero. Disney doesn't seem to have an issue with male characters starting off as morally ambiguous but reforming (Naveen, Flynn, Nick, Maui, etc.) but they never seem to want to do that for their heroines beyond the cookie-cutter Rapunzel mold. I'd even relish a gender inversion of these personality traits with a happy-go-lucky male character winning over and reforming a cynical, jaded female character. I suppose Bolt was sort of like that though and that's probably why even though I find the film pretty generic, I love the character of Mittens! Maybe Disney is afraid of the optics of having a male character "fix" a female character, although the gender inversion of this is super prevalent in their films and can set just as disturbing a trend. Elsa was Disney's closest attempt at making a female anti-heroine, but they never really do anything with her, preferring the much safer Anna. In fact, I wouldn't be surprised if Elsa's lack of screentime in Frozen is probably because they couldn't really go further to develop her character in a way that wouldn't keep her morally pristine. Even the live-action Maleficent doesn't really even make Maleficent an anti-hero. She's basically good throughout the whole film, commits one act of justified malice in the name of revenge, and then quickly regrets her action and spends the rest of the film trying to make things right. Even Elphaba from Wicked was more morally gray which is probably why all the Wicked fandom was terrified of Disney getting their hands on the property. Last edited by unprincess on Wed Feb 13, 2019 8:55 pm, edited 1 time in total. wow that Will Smith Genie...oof what a tacky eyesore. and yes Jafar is rather..flat. I wonder if they restrained him b/c they were trying to avoid an "evil Arab" stereotype? I dunno. I liked most of the rest ...the scenery is ok (except for that dull Cave of Wonders)... Jasmine looks nice. I'd even relish a gender inversion of these personality traits with a happy-go-lucky male character winning over and reforming a cynical, jaded female character. true Id like to see more of that dynamic. I think PATF was the last time we saw that...Naveen was the happy-go-lucky one, Tiana was the all work-no play type. I am so sick of the klutziness being the one flaw a heroine needs to be imperfect. Even Bella from Twilight had that! At least Disney took notice and they're trying to fix things. I’ve just been told to not expect a second Aladdin trailer anytime soon as Disney is continuing to work on the genie's visual effects. Don't expect an Aladdin trailer anytime soon. Despite the fact I loved the trailer, it's apparent Disney saw the backlash, and are working hard to finish perfecting the look of the Genie. Hearing Disney released the Frozen 2 trailer early to counter the Aladdin CGI backlash! Frozen 2 was originally supposed to drop in March. 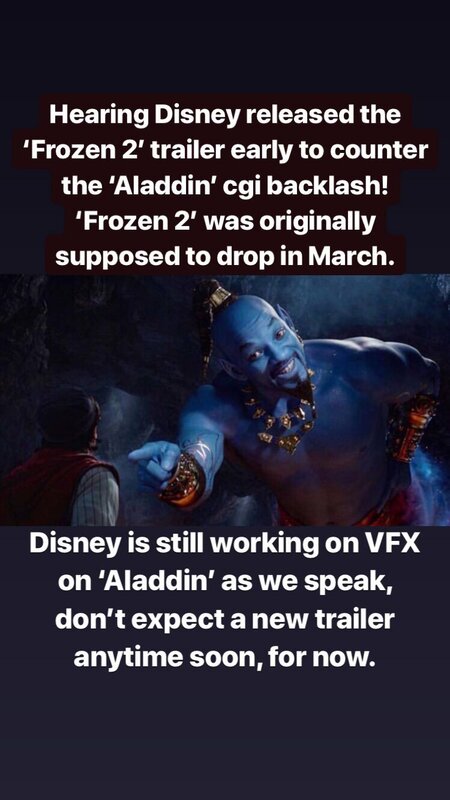 Disney is still working on VFX on Aladdin as we speak. Don't expect a new trailer anytime soon, for now. I'd say Ariel, Quasi, Jane Porter, and Mulan also had "clumsiness/awkwardness" as part of their character in the '90s besides just Hercules. Moreover, I don't think of any of Tiana, Elsa, Judy, Moana, or Vanellope as clumsy or awkward at all. Elsa is the only one whose flaw I would call an "insecurity," although it's mixed with grief/trauma. Some people just want to hate change for the sake of it, regardless of how they have to bend themselves into pretzels to pretend there's actually logic behind it. I never stated that I hated the new characters, what I was saying is that even though Beast, Aladdin, Simba, Meg, Kuzco, Jim, etc... were the heroes and the protagonists of their respective films, they also had moral ambiguity and that made for a more interesting character growth. The only ones I can say this in the new era films are Naveen and Maui (coincidentally M&C films). I also stated here many times that Moana is one of my favorite characters and probably one of the most three dimensional characters Disney ever made. I never said I hated the new films or their characters, only said that in the past Disney characters were more interesting in my opinion, probably because they didn't feel the need to make these characters "unproblematic" like they do now. What flaws does Moana have? She's adored in her island by everybody and she's good at a lot of things. She gets to do her "duties" (because that's something that every sourpuss Disney fan seems to be obsessed with) but also have her adventure to satisfy her "I want" needs. Like, really, is "daddy doesn't like me sailing " such an incredible flaw? No, how about being torn between your Ego and your Id? Repressing what you want to do your duty? Not really knowing about her history and culture. A major one - sometimes she acts recklessly like going after the kakamora by herself, going to Lalotai without understanding what it means, or continuing the fight with Te Ka even though the battle is lost, and yeah not having enough confident that she can actually save the world and have a lot of self doubt. What flaws does Moana have? She's adored in her island by everybody and she's good at a lot of things. She gets to do her "duties" (because that's something that every sourpuss Disney fan seems to be obsessed with) but also have her adventure to satisfy her "I want" needs. Like, really, is "daddy doesn't like me sailing " such an incredible flaw? Agreed. She may be a likeable character but it was clear she was written as a response to previous princesses and particularly to Ariel. I'm not referring to the oceanic theme or that she didn't have a love interest but the way her dream conveniently did not require her to leave her home behind or renounce her position as a leader. Ariel has long been criticized for abandoning her people and her family and preferring a different culture over her own. Belle has similarly been criticized, to a lesser degree of course, for wanting to leave her home and looking down on her fellow townspeople and their lives. The only flaws female characters are allowed to have anymore are the very inoffensive and socially acceptable ones like being naive, insecure, awkward, working too hard etc. Male characters are permitted to have worser flaws, make bigger mistakes, be more morally questionable and still be portrayed as good people.